Juggling jobs cartoon - guy juggling different aspects of him job. 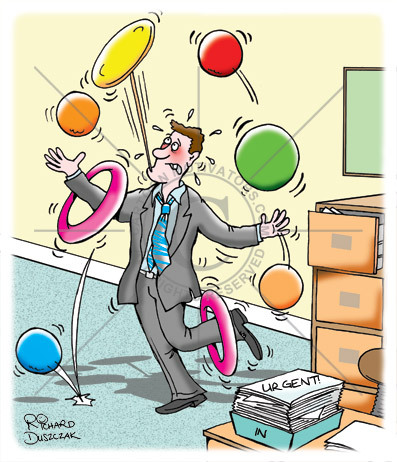 Office cartoon of guy juggling different jobs, urgent work, you can add your own captions to the items he's juggling like: H & S, HR issues, core business, VAT, management accounts, invoicing and collections payroll PAYE. He's sweating as he tries to juggle a number of different jobs.